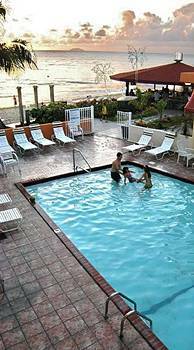 Puerto Rico hotels - information, accommodation, basic facts, Puerto Rico Hotels. Find the best accommodation deals for Villa Cofresí Hotel & Resort right here! Rates: Starting at $145 per night for standard room during lean months and $175 using peak inclusive of complimentary continental breakfast. If you are visiting the surfing capital of the Caribbean, Rincon on the Porta del Sol region of Puerto Rico, there are just a few hotel options in the city and one of them is the family owned Villa Cofresí Hotel & Resort. Built in 1965, the hotel today is the cheapest and the oldest vacation experience in the city. Considered a romantic hideaway for couples and a family vacation getaway, Villa Cofresí makes readily accessibly to everyone the splendid Rincon beach acclaimed as the finest in the western shores of Puerto Rico. Villa Cofresí has become one of the country’s most popular recreational and leisure sports resorts in the country offering a diversity of water fun depending on the season. During the vacation months from December to April, guests can engage in whale watching, deep seas fishing, snorkeling and diving. You can also enjoy banana boat rides with kayak and jet ski rentals as well as stand up paddle board rentals. But lest we forget, the Rincon beach is really known for its world class surfing tides. Situated in the same area as the Domes Beach and the Rincon Lighthouse, Villa Cofresí is nestled right on the gorgeous Rincon beach. You can have easy access to several local attractions such as the Mayaguez Zoo. The 3-storey Villa Cofresí Hotel offers 69 guestrooms, many of which offer a breathtaking vista of the Rincon beach sunsets and views of the spectacular Caribbean waves lapping on its beaches. Each room is professionally designed and appointed with a rev, TV with satellite cable, wireless WiFi provides internet access and coffee/tea makers. Bathrooms have hair dryers and housekeeping is done daily. Ironing boards, infant cribs and wake-up calls are available on request. The hotel features an outdoor swimming pool with a bar lounge on the side and another pool dedicated for the children. It also has banquet and business facilities, a massage, and spa treatment rooms, complimentary parking for quests, complimentary use of a nearby fitness gym and a few banks with ATMs. Villa Cofresí Hotel houses a couple of restaurants. Operating since 1965, the La Ana de Cofresí is the first restaurant in Rincon. Situated right on the beach, it has the charming rustic ambiance to complement the exotic local cuisine considered the best seafood delicatessen in Porta del Sol. Another culinary attraction is its Beach Bohio or beach bar that is just a few steps from the beach waters. Considered the most popular and happiest place to be in this part of Porta del Sol, the bar lounge offers the best view to the spectacular sunsets while sipping its famous Pirate Special, a creamy concoction of fruity frappe and piña coladas, its Bruja Negra, another exotic drink, or your favorite alcoholic beverage.